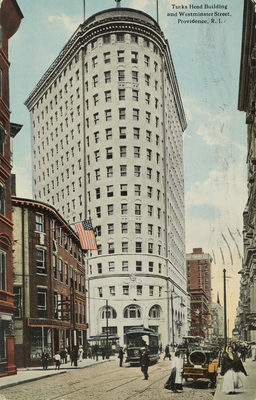 "Turks Head Building" by Berger Bros., Providence, R.I.
Used; Postmark: October 19, 1914; Caption: "Erected at the Eastern junction of Weybosset and Westminster Streets, 16 stories high, covering nearly 13,000 square feet of ground space and each floor contains 7800 square feet of rental space. It is the tallest office building in New England." Berger Bros., Providence, R.I., "Turks Head Building" (1914). Rhode Island Postcards. 66.